I had a great Christmas in Vancouver with Jenn's and Katie's families along with Jim. It is now official Jim and I are engaged. The date is March 8, 2008 here in NC, we would like all who can come to come. This is the ring. It is just what I have always wanted. Didn't he do a great job. I think so!! I received it on Christmas eve. It was so neat and special the way he asked me. He was so excited and it is a day that I will never forget. I am so blessed to have someone like Jim in my life and to spend the rest of my life with him. I know that those of you that haven't meet him will love him just like I do. He is so kind and full of the spirit. So it's really too bad that I can't upload a picture with my comment. We have the same ring. 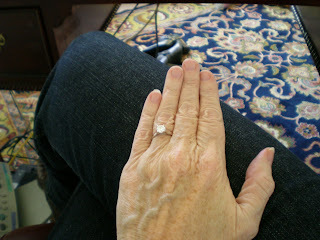 The diamond is a little bigger in Mom's but otherwise the same. Good picking and congrats on making it all the way official! Congrats Jim and Mom. We are all very excited for you. Karen I am so happy for you. I love your hair dark by the way. Congrats Karen. Mom says your dress is beautiful. Can't wait to see pictures.